We are committed to bringing you the highest quality air conditioning services Chicago has to offer. We want to see our customers avoid the summer’s humidity with a properly functioning A/C system you can count on. For 24/7 emergency service, call Command Service at (847) 558-7780 or with our online contact form to keep your home cool and comfortable this summer! 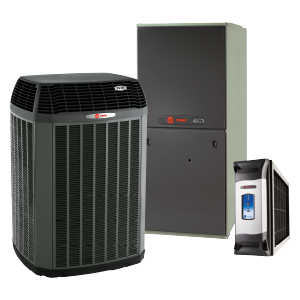 Our Trane products and expert technicians are here to serve you. We offer routine and seasonal maintenance to ensure your A/C unit is always working at full capacity. Is your old A/C unit shot and you need a new one installed? Our technicians are the most skilled in the business to do just that! Is your A/C not blowing cold air, or turning ON and OFF continuously? Call us to take a look, we can help with repairs that may be needed. Command Service offers fast and affordable A/C replacement. Learn more about how we can help you with a total replacement. If you need additional help or information on our A/C services, give us a call today at (847) 558-7780!